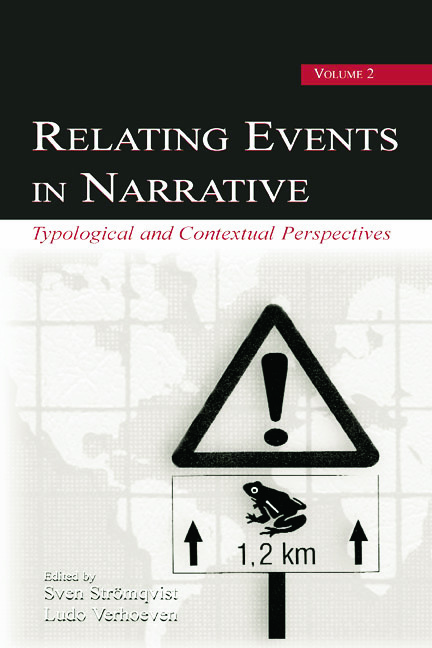 Relating Events in Narrative, Volume 2: Typological and Contextual Perspectives edited by Sven Strömqvist and Ludo Verhoeven, is the much anticipated follow-up volume to Ruth Berman and Dan Slobin's successful "frog-story studies" book, Relating Events in Narrative: A Crosslinguistic Developmental Study (1994). Working closely with Ruth Berman and Dan Slobin, the new editors have brought together a wide range of scholars who, inspired by the 1994 book, have all used Mercer Mayer's Frog, Where Are You? as a basis for their research. The new book, which is divided into two parts, features a broad linguistic and cultural diversity. Contributions focusing on crosslinguistic perspectives make up the first part of the book. This part is concluded by Dan Slobin with an analysis and overview discussion of factors of linguistic typology in frog-story research. The second part offers a variety of theoretical and methodological perspectives, all dealing with contextual variation of narrative construction in a wide sense: variation across medium/modality (speech, writing, signing), genre variation (the specific frog story narrative compared to other genres), frog story narrations from the perspective of theory of mind, and from the perspective of bilingualism and second language acquisition. Several of the contributions to the new book manuscript also deal with developmental perspectives, but, in distinction to the 1994 book, that is not the only focused issue. The second part is initiated by Ruth Berman with an analysis of the role of context in developing narrative abilities. The new book represents a rich overview and illustration of recent advances in theoretical and methodological approaches to the crosslinguistic study of narrative discourse. A red thread throughout the book is that crosslinguistic variation is not merely a matter of variation in form, but also in content and aspects of cognition. A recurrent perspective on language and thought is that of Dan Slobin's theory of "thinking for speaking," an approach to cognitive consequences of linguistic diversity. The book ends with an epilogue by Herbert Clark, "Variations on a Ranarian Theme." "…the studies in this volume explore a wide variety of variables that may affect narrative function (e.g., bilingualism and theories of the mind) in addition to continuing to examine the developmental perspective of the first volume. Finally, in the epilogue, Clark points out additional perspectives on the process of narration that should inspire additional research…"
Contents: Preface and Acknowledgments. S. Strömqvist, L. Verhoeven, Prologue: Typological and Contextual Perspectives on Narrative Development. Part I: Typological Perspectives. E.L. Bavin, Focusing on 'Where': An Analysis of Warlpiri Frog Stories. P. Brown, Position and Motion in Tzeltal Frog Stories: The Acquisition of Narrative Style. E. Engberg-Pedersen, F.B. Trondhjem, Focus on Action in Motion Descriptions: The Case of West-Greenlandic. I. Ibarretxe-Antuñano, Motion Events in Basque Narratives. H. Ragnarsdóttir, S. Strömqvist, Time, Space, and Manner in Swedish and Icelandic: Narrative Construction in Two Closely Related Languages. D.P. Wilkins, The Verbalization of Motion Events in Arrernte. J. Zlatev, P. Yangklang, A Third Way to Travel: The Place of Thai in Motion-Event Typology. D. Galvan, S. Taub, The Encoding of Motion Information in American Sign Language. D.I. Slobin, The Many Ways to Search for a Frog: Linguistic Typology and the Expression of Motion Events. Part II: Contextual Perspectives. R.A. Berman, The Role of Context in Developing Narrative Abilities. M. Hickmann, Coherence, Cohesion, and Context: Some Comparative Perspectives in Narrative Development. A. Aksu-Koç, G. Tekdemir, Interplay Between Narrativity and Mindreading: A Comparison Between Turkish and English. A.C. Küntay, K. Nakamura, Linguistic Strategies Serving Evaluative Functions: A Comparison Between Japanese and Turkish Narratives. S. Strömqvist, Å. Nordqvist, Å. Wengelin, Writing the Frog Story: Developmental and Cross-Modal Perspectives. J. Kupersmitt, Form-Function Relations in Spanish Narratives: A Comparative Study of Bilingual and Monolingual Speakers. L. Verhoeven, Bilingualism and Narrative Construction. H.H. Clark, Epilogue: Variations on a Ranarian Theme. Appendices: Frog, Where Are You? Frog-Story Research as per 1994. Frog-Story Research After 1994. Typological Overview of Frog-Story Research. Format and Abbreviations for Glosses.